Make audio clips from books to play in iTunes. Is there a better alternative to Read Me a Book? Is Read Me a Book really the best app in Audio category? Will Read Me a Book work good on macOS 10.13.4? 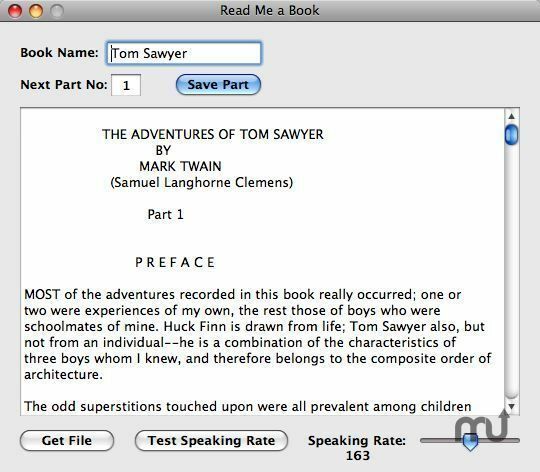 Read Me a Book was developed to help users make audio clips from books so that they can listen to a book using iTunes. The book can be broken up into parts so that the audio clips are reasonably sized. The user can set the voice and speaking rate used by the audio clips. Read Me a Book is $10 shareware. The Demo Mode lets the user save Parts 1 through Part 5 without registering. Read Me a Book needs a review. Be the first to review this app and get the discussion started! Read Me a Book needs a rating. Be the first to rate this app and get the discussion started!